Eddie Collins, considered by some to be the greatest second baseman in baseball history, played on six World Series-winning teams over his career that lasted a quarter century. This top list of Collins' greatest trading card appearances range from highly sought-after tobacco cards to his later releases during the 1930s and 1940s. Shop for Professionally Graded Eddie Collins Cards on eBay. 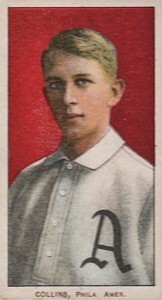 Collins broke into the major leagues with the Philadelphia A's in 1906 while still attending Columbia University and he even played his first games under a false name to avoid losing his amateur eligibility. His career was split between long stretches with the A's and the Chicago White Sox and he is the only player to have spent at least 12 seasons with two separate teams. A consistent batting marvel for the A's, Eddie Collins helped them win World Series titles in 1910, 1911, and 1913. He would add another title in 1917 with the White Sox but, just two years later, many of the team's players would disgrace themselves in the "Black Sox" scandal of 1919. Collins himself was never accused in the wrong doing and the events have done no damage to his glowing reputation. Collins rejoined the A's for his final four seasons in a limited role and would be on the roster for their back-to-back World Series runs in 1929 and 1930. After retiring, Eddie would become the general manager of the Boston Red Sox for 15 seasons. Along with being an amazing contact hitter who would finish his career with a .333 batting average and 3,314 hits, Collins also became baseball's first stolen base king. He was the first player to steal more than 80 bases in a season and shares the record for most steals in a single game at six. Collins' long career allowed him to amass an impressive résumé of records, becoming the all-time leader for assists and games for a second baseman. Overall, he was second in games, walks, and stolen bases at his retirement. For fans who don't have an interest in tobacco cards, Collins has several notable cards from memorable sets of the 1950s and 1960s. Collins was included in 1963 Bazooka All-Time Greats and collectors can find gold and silver versions of his card. In the 1959 Fleer Ted Williams set, Collins is featured on many of the cards with Williams in his role as a Red Sox team executive. 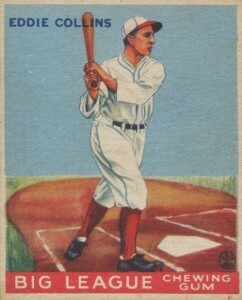 The 1950 Callahan Hall of Fame set includes a black-and-white sketch card of Eddie that was produced by the Baseball Hall of Fame. 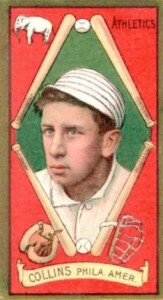 The main baseball card appearances for Eddie Collins are spread throughout the tobacco cards from the turn of the century to important pre-World War II sets. This makes many of them unaffordable for budget-conscience collectors. However, in constructing this list, card value is balanced with its accessibility to buyers to offer something for all collectors. Paper quality is the key to figuring out if your 1948 Baseball's Great Hall of Fame card is real or reprinted. The original versions are printed on darker grey stock while the reprinted versions are done on lighter whiter paper and made in the 1970s. 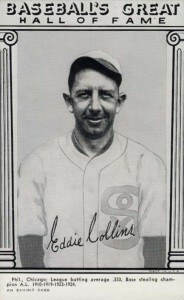 Collins' card features a photograph head and neck and then an illustrated sketch of the rest of his body, including his White Sox jersey. Along with this entry from the Exhibits brand, collectors can also find one of the most budget-friendly cards from Collins playing days in the 1927 Exhibits set. 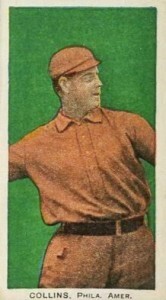 Although Collins is featured as a Chicago White Sox on his 1951 Topps Connie Mack All-Stars card, he actually played under Mack with the Athletics for 13 seasons. 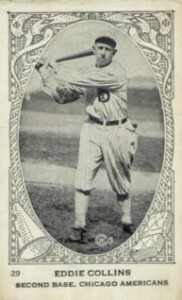 Mack sold Collins to the White Sox after the 1914 season when contract negotiations for what could have been the largest player contract to that point broke down between Collins and the team. Rather than being included in cigarette packs, the cards in the 1910 Standard Caramel came packaged with candy. The card uses a black-and-white photograph of Collins with an intense green background and tan uniform printed over the top of the image. Collins' card is a mid-range hit in terms of value with Eddie's checklist neighbor — Ty Cobb's card #7 — the key entry in the 30-card set. What Collin's card in the Neilson's Chocolate set lacks in color, it more than makes up for with its ornate and original design. The Canadian set includes 120 cards in total and the reverse has an advertisement for Neilson's "big league chocolate bars." Two nearly identical versions of this set were created and the key to distinguishing them is that the second printing removed the card's checklist numbering from the bottom-left corner of the card. While Collins had second base covered for the A's for more than a decade, his teammate Frank Baker handled third. 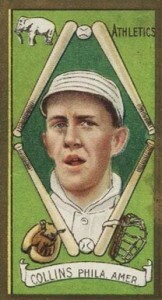 Frank earned the nickname "Home Run" Baker by leading the league in home runs three straight years with seemingly unremarkable totals of 11, 10, and 12 home runs, respectively. The 1911 Mecca Double Folders set is certainly the inspiration for the 1955 Topps Doubleheaders set issued more than 40 years later. The tall cards allow two players to share the same card and the same pair of legs when the top part of the card is folded over on itself. Collins' autographs are few and far between and their cost puts them out of reach for most collectors. However, bat and jersey relics are far easier to locate, including this bat relic from 2002 Topps Tribute Milestone Materials. Fans can also find Collins relics in more recent sets like 2014 Panini Classics and 2014 Panini National Treasures. The 1910-1911 Turkey Red cabinet cards could be obtained by sending in coupons from several cigarette brands, including the Turkey Red brand, hence the set's famous name. These gray bordered cards are some of the largest from the tobacco card era, measuring 5 1/2 by 8 inches. 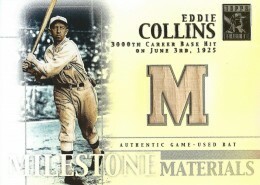 Collins has two cards in the tobacco card set given the designation T205. Known for its distinctive gold border, the cards for Eddie Collins are distinguished by the differences in his portraits as one has a closed mouth and the other shows an open mouth. Collectors have placed a value premium on the "open mouth" card at more than double that of the "closed mouth" version. 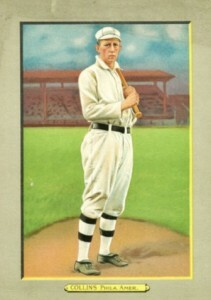 Collins had been out of the majors for three seasons at the time he was included in the 1933 Goudey set. The reverse side of the card assigns Collins to the Boston Red Sox as he was their vice president and general manager at this point. However, he never played a game for the Red Sox and so this card is an interesting baseball card anachronism and also his official rookie card. Collins is fresh faced and had only been in the league a few seasons when he was included in the T206 set. The huge 525-card set was issued over the course of three years and has proven to be the most popular tobacco set. While near-mint and mint copies are nearly impossible to find, excellent graded versions of Collins' card can top $500 at auction. 1931 EDDIE ( EDDY ) COLLINS W517 # 52 BLACK SOX CLEARED !! 1921 E253 Oxford Confectionary Candy Eddie Collins Nice! 1933 Goudey #42 Eddie Collins HOF Red Sox SGC 35 !! !